Esta página está sendo redesenhada para o Projeto de Lugares da Lore (LPP). A página pode precisar de algum trabalho para se encaixar em nossos padrões da página do projeto. The realm of Battlespire, the magical academy of the battlemages, is located in a thin slipstream between Oblivion and Mundus. It acted as a sort of proving ground and testing facility for the Shadow Legion, the Imperial Battlemages. It could be accessed via the Pillar of Light, a teleportation device linked to the Weir Gate. 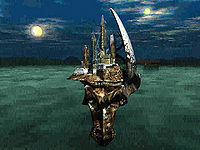 The Battlespire has been in existence since at least the Second Era. The stronghold was attacked by invading Daedra during the Imperial Simulacrum, all of whom bore the Daedric Crescent. 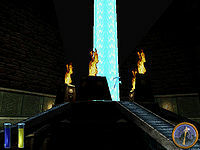 The Battlespire was destroyed during the invasion's aftermath. The Empire later reclaimed the ruined Battlespire, and gathered up all the Daedric Crescents to be destroyed—all but one. The Weir Gate is the portal through which the Battlespire was accessed. During the attack on the spire by Mehrunes Dagon's forces, the gate was sealed with a powerful sigil in the shape of the Daedric letter "Hefhed". This meant that no reinforcements could come to the spire, and the battlemages were trapped inside. Many years after Dagon's invasion was defeated, the mage Morian Zenas and his apprentice attempted to use the Weir Gate to enter Oblivion. They found that although the gate still stood and the shattered academy remained accessible from Mundus, the link to Oblivion had been broken. Esta página foi modificada pela última vez à(s) 16h26min de 1 de julho de 2015.